Saturday’s game was full of spirit buoyed on by a fantastic crowd but grudgingly I have to give huge credit to Manchester Utd for the professional job they did, gaining their third 1-0 league win in a row none of which could be said to contain champagne football but have brought in the points. It’s a credit to Swansea that Man Utd went with a team which could well be as strong, if not stronger than the one they will put out on Tuesday in the Champions League. It doesn’t take a rocket scientist to work out that the best way to combat our passing game is to play a high tempo pressing game high up the pitch in particular around the Rangel-Dyer axis through which so much of our play revolves. 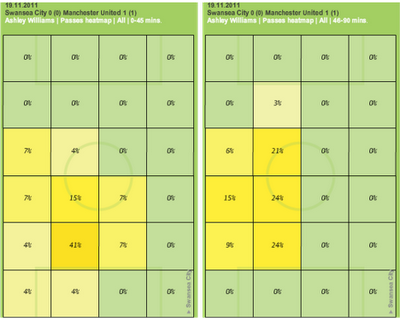 Areas of Passing shows the focus of activity down the right hand wing during the first half. 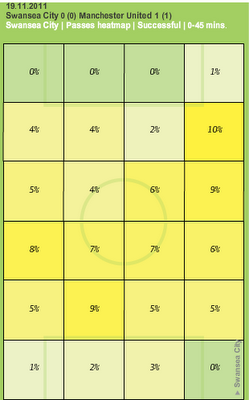 In the Second half the figures were more even with 24% for upper right and 19% for upper left hand quadrant. 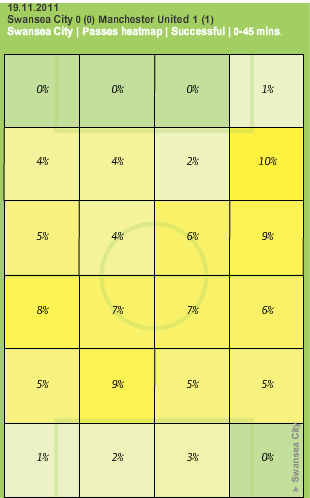 ﻿﻿﻿The potential downside for any team playing an aggressive pressing game is that it’ll leave more space behind, in particular for Dyer and Sinclair to exploit if a way through can be found. It then becomes a game of your pressing vs. our passing which is difficult for a pressing team to maintain for a long period of time. From a Swansea perspective the highlight of the first half had to be the dribbling of Dyer, in total he had six successful ‘Take on’s’ where he dribbled past a player. Of these six, five were in the first half with only one in the second half. 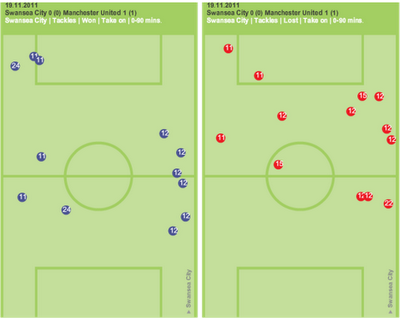 Unfortunately, the early Man Utd goal meant that in the second half especially Man Utd could afford to sit deeper. This resulted in Swansea only managing one shot on target the whole game and ten attempts overall, Sinclair’s miss in the first half being insufficiently goal bound to be classed as an attempt. The second half saw Ashley Williams become an increasing presence in midfield as Man Utd sat deeper, 30% of his passes were in the opposition half during the second half compared to only 11% in the first half. In the first half 60% of Williams' passing was in the defensive third compared to only 33% in the second half. Overall successful passing volumes were 521 Swans (254 1st half, 267 2nd half) vs. 536 Man Utd (308 1st half, 228 2nd half). It could be argued that some of this increased Swansea pressure was due to the introduction of Allen for Routledge but in my opinion was more dictated by Man Utd's happiness to sit back and allow the ball to be moved around in front of them. There's no shame in losing to Man Utd and given the team Utd picked and the fact they were happy to largely sit on a 1-0 lead shows that not many teams will come and steamroller the Swans at the Liberty. The next three home games are Villa, Fulham and QPR all of whom are in my opinion upper-middle teams who I'd expect to finish between 8th and 15th so will provide a good benchmark.